The Courtyard House encompasses both a new build and a conversion to the modest St Saviour’s Church in inner-city Collingwood. With its dense composite of residential conversions and developments within mixed-use industrial, this context provided an architectural opportunity to rethink the family home while incorporating a former place of worship. The owner-architect’s brief was to create a private sanctuary for a family of five within this urban hub. Implicit in this was the versatile utilisation of the church space. As a primary response, the approach was to maximise the site footprint and northern orientation to create a seamless integration of old and new, interior and landscape. High perimeter walls create an immediate sense of enclosure and proportionate scale to the church and nearby buildings. 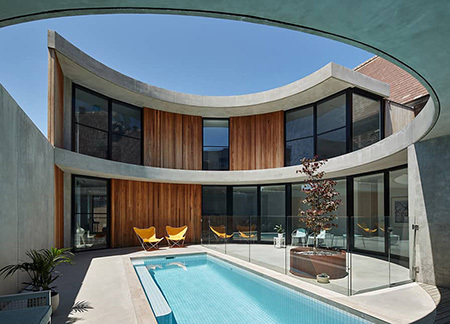 Where a curved plane of concrete in this facade peels away along the street front, a concealed entry opens into a vast outdoor courtyard, dominated by a 17-metre lap pool and concrete canopy above. The church rises to the right, while at ground level it is sensitively connected to the new construct via a glass link. This is a pivotal point; more than a physical connection, it is a symbolic link between old and new, a subtle transition into the former place of worship. Similarly connecting the old and new, the circular courtyard is the site’s focus. Raised to the ground plane of the built elements at upper-street level, its form is a nod to Ground’s Hill St house. In the courtyard’s creation, the standard house cube has been cut away and, where it thins to an horizontal plane, the resultant canopy creates a sharp linear contrast to the rounded forms. Orientated to this courtyard, the home’s living areas on both levels are flooded with northern light, which generates a play of light and shade within and blurs the boundaries between inside and out. The upper level is set back and overlooks the courtyard and a roof garden. The clarity of detail and pared back finishes throughout create a clean Modernist aesthetic that elicits a sense of calm, in contrast to the bustle of the urban surrounds. An extensive use of concrete in this new addition both complements and contrasts the existing church fabric, while original windows and bluestone footings have been reintegrated into the new building and landscape in considered ways. The church itself has been stripped back to its core structural elements. By demolishing the apse and bricked archways, and inserting glazing instead, its formerly dark interior is flooded with light and celebrates the building’s historic beauty and volume. Sustainable principles have been adopted throughout: skylights and internal windows allow natural light into internal spaces, reducing the need for artificial light; heat gain is controlled through canopies, double glazing and blinds; the courtyard allows continuous cross ventilation; and, the thermal mass of exposed ground slab, coupled with appropriate insulation, helps to regulate the internal environment in all seasons. The rooftop garden provides insulation, softening the exterior aspect and attracts wildlife in this urban location.